This is a matching cat scarf and hair pom pom clip. 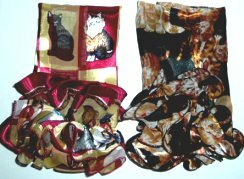 The cat scarf is 100% polyester and measures 13" wide x 61" long. The hair pom pom is made of the same scarf material. The pom pom is 6 1/2" wide and is mounted on a 3" wide hair clip. Only burgandy and gold with different cats left.